Tall Bearded Historic Iris "WABASH "
Fragrant, Classic and Tailored elegance are the attributes that 'Wabash' a very popular Iris in the 1940's adds to any Garden it is growing in. High plant health, good increase, and copious bloom right from year one makes this iris the winner of the Dykes Medal in 1940 a must have. This iris display's the purple bottom foliage that is essential for the correct ID of this variety but this aspect would not be a clincher as I have always firmly believed that the elusive and mysterious Mt. McKINLEY, a 1947 Schreiner's introduction has the same PBF, with slightly larger flowers, it bloom's only marginally earlier and is a dead ringer of Wabash. Above photo taken over at the Woolshed garden and shows background plantings of 'Iceberg' Climbing Rose and Penstemon 'Purple Passion'. Carl Salbach Berkeley, California, Iris and Selected Seed Specialists, 1941. WABASH (Williamson 1936) For a long time we have been looking for a good big iris with white standards and deep blue falls. Wabash fills the bill in every particular.It is described by the introducer as "A sensation in Iris of this type. You can see it a city block," and comments by A.I.S. judges include: "One of the most beautiful irises ever introduced," and "Far ahead of others in the amoena class." Technically described as standards white, falls hyacinth violet, edged white. H.M.A.I.S., 1937. 40"
WABASH (Williamson 1936) M 36"
Schreiner's, Salem,Oregon, Iris Lovers Catalog 2009. We are proud to offer Wabash, a truly historic Iris. Its simple tailored form speaks with a quiet elegance. The clean white standards offer good contrast to the deep plush reddish purple of its falls. Note also the delicate white wire rim on the edges of the falls. Interesting information gleaned from the 1939 Checklist about the Hybridiser's father Edward Bruce Williamson 1877- 1933, Banker, Naturalist, Authority on Dargonflies. 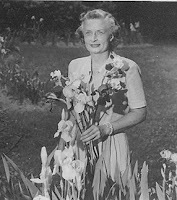 Fellow of Vanderbilt University 1900-1901, Assistant Curator, Carnegie Museum 1898-1899, Honorable Curator odonata, University of Michigan 1916-1928 and from 1928-1933, Research associate, Museum of Zoology, University of Michigan. Began to raise Irises about 1906, interested in making crosses between species and later worked with Bearded mostly, producing many splendid varieties especially noted for their good growing qualities. Longfield Iris Farm Bluffton Indiana was founded by E B Williamson . Paul Cook became a partner in 1920 but retired in 1928 to devote his time to breeding.Mr Williamson can be considered as the second really great Iris breeder in the United States, Mr Farr having been first. After Mr Williamson's death in 1933 the nursery has been carried on by his daughters and is now being run by Mary Williamson. The Williamson Irises have been noted, LENT A WILLIAMSON being the landmark in Iris breeding equal perhaps to DOMINION in this respect. 'Wabash' is the name of Indiana's most famous river. Recently many fine new varieties have gone forth including the Rome Gold Medal winner, E.B. WILLIAMSON (P.Cook), SABLE (P.Cook), AMIGO , WABASH , MOONGLO , DOLLY MADISON, ETHEL PECKHAM. Wabash- The name according to J.P. Dunn is an abbreviation of the Miami name for stream- Wa-ba-shi-ki or Wa-pa-shi-ki meaning bright white and referring to the limestone bed of the stream in its upper course. M. Williamson, 1936 TB M W3D, (Dorothy Dietz X Cantabile), HM 1937, AM 1938, Dykes Medal 1940. AIS 1939 Checklist page 47, Longfield Iris Farm, infers Mary Williams as the Originator, but the Iris Society, (BIS), Year Book 1941, p21, notes the following. Tall Bearded Iris "BOLD FASHION"
Big, Bold, and stunning blooms are what you get when get to grow 'Bold Fashion'. Colour's take a bit of getting used to and I'm not 100% convinced if it is an Amoena type due to its creamy peach standards. Judith Berrisford summed up this situation in her book 'Irises' (Gardening Book Club, 1961) when she coined the term 'Near-Amoenas' in which the near white standards are tinted with some other colour and have deeper coloured falls. Or just maybe it is a brassy Emma Cook pattern iris in full high definition colour. Whatever it is, the involved parentage of 'Gypsy Woman' had a big say in the way 'Bold Fashion' presents. Fertile, so could make an interesting parent. Schreiner's, Salem,Oregon, 1999, Iris Lovers Catalog. BOLD FASHION (Schreiner 1998) TB M L 37"
The Spring 2009 The Siberian Iris has turned up in the Post, and as usual an enjoyable and informative read. 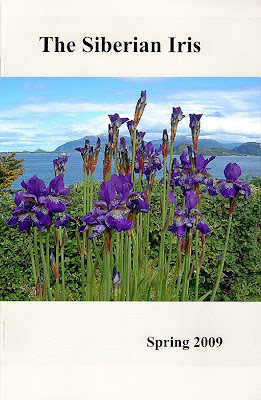 The photo featured on the cover is of Siberian Irises in Norway with the Valderøy fjord in the background. Photo credit Patricia Hamilton. TSI is distributed to members of the Society of Siberian Irises twice a year, with interesting information and coloured photos dedicated to the amazing Siberian Irises. Siberian Iris lovers worldwide who wish to receive quality iris information plus the many other benefit's of membership should give serious thought to Join The Society for Siberian Irises it's a great investment, for a very reasonable cost. Could a peony grower from the Manawatu explain just which “good authority” he is referring to when he recently publicly stated : “I have it on good authority that the wrong ID of the Begg Shield Iris was entirely the fault of the hybridiser”? In November 2008 at the Gisborne Iris Convention, 'Irwell Ace' an Iris bred by Ron Bush won the Begg Shield- or did it? 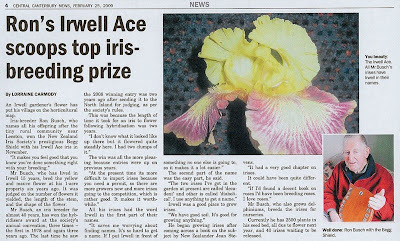 An article published in the Central Canterbury News (CNN) February 25th 2009 (see below) features a photo of an iris attributed to Ron and supplied to the CCN by a senior member of the NZIS who attended the Gisborne Convention as the Begg Shield winning Iris. 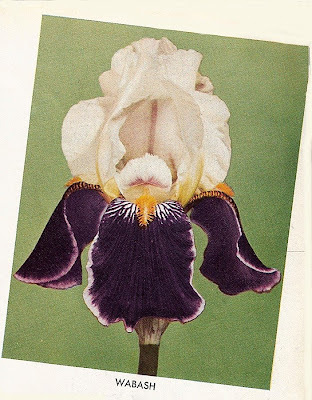 I am sure you will agree it's not a flattering photo for whatever the variety might be, but it clearly shows that the iris depicted in the article is not the one in the scanned photo above from Ron's photo album, and it bears no resemblance to the Checklist description for this cultivar. The only logical conclusion one could make is that the Begg Shield winning Iris is not 'Irwell Ace'. 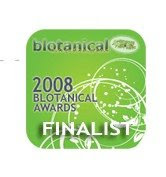 Apparently a Begg Shield iris is judged by a panel of THREE ACCREDITED JUDGES, yet none were able to spot the mistake. Even using the concept of 'Blind Judging', after an Iris has a prize awarded and a name is attributed to the winners, who checked that these are correct? 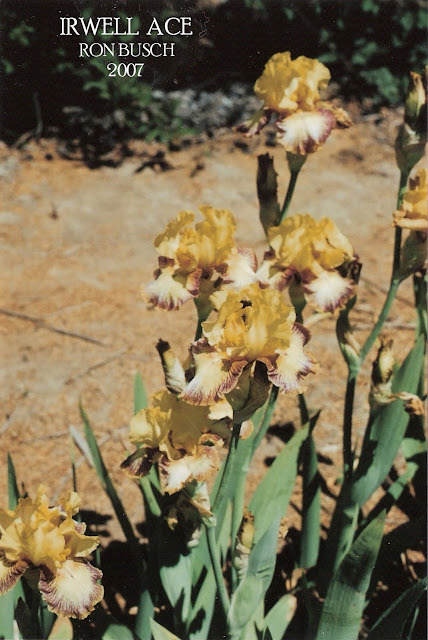 All of the six irises submitted to the Gisborne Convention Garden by Ron Busch in 2006 were labelled and were registered in 2007, so descriptions were available well before the time of judging in 2008. In fact the registrations of these Irises were published in the NZIS booklet #172 June 2007, and perhaps that was the start of the problem. 'Irwell Ace' published on page 11 is listed as 'IRWELL LACE' and for this iris it seems it all went downhill from there. One would have to think that this situation is nowhere near 'Gold Standard' and that this group has got this situation horribly wrong, but it gets worse. I have been reliably informed that the Iris pictured below in the CCN article was divided and auctioned for very high prices at the Convention as 'Irwell Ace' so now how many Irises are growing in New Zealand gardens with potentially the wrong ID. There are other questions that need answering. What has happened to the real 'Irwell Ace' that was sent to the trial gardens? Was that also sold and auctioned as well? And under which label could this iris now growing? Listed below is the checklist descriptions of all the Irises submitted by Ron Busch to the Gisborne Convention Garden. IRWELL ACE (Ron Busch R. 2007). Sdgl S1490-1205. TB, 31" (91cm) ML. S style arms and F. gold. F. ½" purple brown plicata border, gold brown edge, purple brown shoulders; beards yellow. Parentage unknown. IRWELL COURAGE (Ron Busch R. 2007). Sdlg. 01587-2149. TB 40" (102cm). M. S.lemon, red purple midrib and blush at base: style arms yellow, purple centre; F. Red-purple, ¼" paler edge, yellow shoulders; beards bronze. Parentage unknown. IRWELL ELEGANCE. (Ron Busch R. 2007). Sdgl. E925. TB 36" (91 cm). M. S. wine red; style arms orange and wine red; F. velvety wine-red, ⅛" plain wine red border,white veining in throat; beards red orange. Parentage unknown. IRWELL QUEEN’S DRAMA (Ron Busch R. 2007). Sdgl. M1552-0283. TB. 38" (97cm), M. S. Orange; style arms light purple, orange edge; F. Apricot, 1" wide band of red-copper spotting; beards orange bronze. Parentage unknown. This Intermediate Iris has a increase similar to weeds, virtually un-stoppable.This early blooming Iris has increase similar to weeds, virtually un-stoppable. It's bloom colouring is distinctively old fashioned, reminds me of you know toile, or if that doesn't ring a bell how about red and cream transferware! Get what I mean?? Great to grow somewhere near the front of the border. It's pod parentage is from Jim Gibson's Award winning 1960 introduction 'Henna Stitches' described by Cooleys as 'A very bright combination of frosty white and gleaming henna-copper'. Raspberry Acres, has an interesting pollen parent pedigree which is the seedling F4 . An iris which has a genetic History+, and in my opinion still has an interesting breeding potential for use in the median plicata field and as I have noted that it does set seed. Bulletin of the American Iris Society, October 1969, Number 195. Intermediate and Standard Dwarf Bearded, Alta Brown. Flightlines. The Little Early Ones, Mildred Brizendine, Topeka, Kansas. Of the IBs, I feel ARABI TREASURE was the best in every respect. Wilma Greenlee's come next. Her reds, INDIAN FIRE and 64-6, are outstanding. RASPBERRY ACRES and SNOW CHERRIES are red plics. 4~ Square Iris Gardens, Eau Claire,Wisconsin, Cold Climate Iris, 1982. RASPBERRY ACRES (W. Greenlee, R. 1968). Sdlg. 67-2. IB 18" E. W2RV-O. White ground plicata sanded raspberry pink and brown; white beard tipped brown. Henna Stitches X Greenlee rose-pink sdlg. (F4 Cretica x Cherie)., Greenlee 1968.